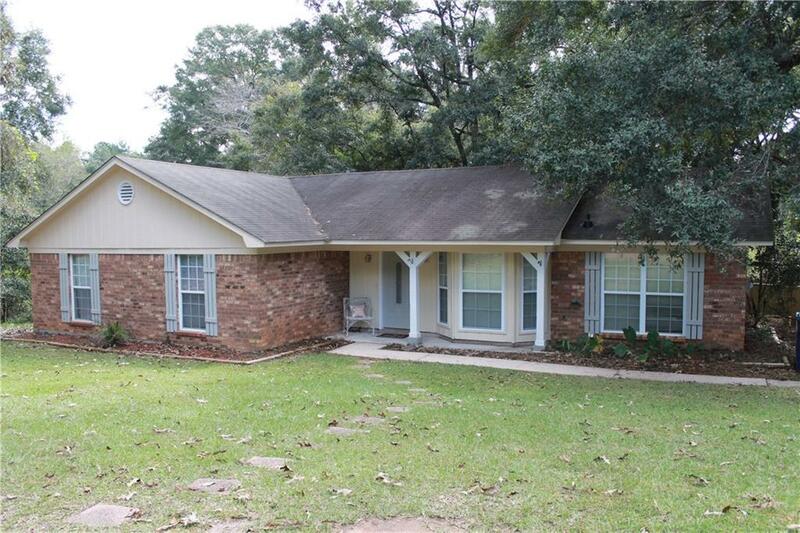 Are you looking for convenience & charm in West Mobile? This lovely home has both! Tucked quietly in a cul-de-sac in West Mobile, this cottage has been newly updated & is convenient to both shopping & restaurants. HVAC indoor/outdoor units replaced in Sept. 2018. Kitchen has been updated with new paint, subway tile backsplash & cabinet hardware. New stainless steel stove & dishwasher in 2016. Refrigerator does not stay in the home. The spacious living room area has soaring vaulted ceilings & a floor to ceiling stone fireplace. There is a 14×10 wood porch off the living area-perfect for that early morning cup of coffee or that weekend family BBQ. Large, fenced back yard. Spacious front yard with fruit trees. New paint throughout. New recessed lighting in hallway, kitchen, dining & living room areas. New bead board walls in the hallway. New blinds throughout the home. Guest bedroom has a new pallet wall which would make a great backdrop for a bed plus a new ceiling fan. Master bedroom walk-in closet has two built in storage cabinets & a secret storage area behind the wall mirror. New vanity in master bathroom Nov 2018. Roof is approx. 12 years old. Seller is offering a one year home warranty thru America’s Preferred Home Warranty Company. Come home to 8061 Kimberlin Court!